Human Rights group challenges psychiatrists at the World Congress of the International Association for Adolescent and Child Psychiatrists to cease prescribing dangerous drugs to children. 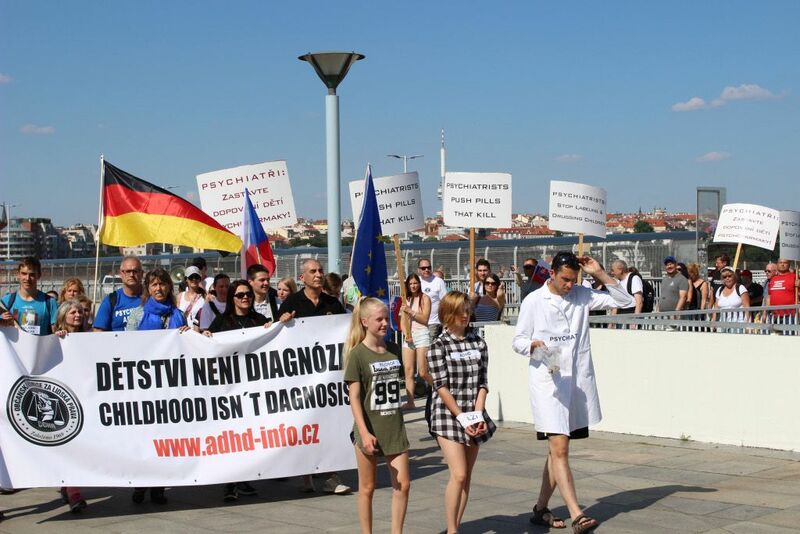 PRAGUE, August 17, 2018 – PRAGUE, August 17, 2018 (Newswire) – Citizens Commission on Human Rights, an international psychiatric watchdog group, wants adolescent and child psychiatrists to answer some very pointed questions. They demanded those attending the World Congress of the International Association for Adolescent and Child Psychiatrists in Prague cease their continued use of antidepressants on children and teens. A nine-year study in British Columbia of 20,906 children age 10 to 18 who were diagnosed with depression and prescribed an antidepressant found their suicide rate was five times that of other teens the same age. Harvard Medical School researcher Dr. Sebastian Schneeweiss stated the analysis of these findings supports the decision of the U.S. Food and Drug Administration’s black box warning that these drugs increase suicidality risk for children and adolescents. CCHR protested the continued use of these dangerous drugs by child and adolescent psychiatrists in the face of such clear evidence that the practice puts children and teens at grave risk. They then opened the exhibit, Psychiatry: An Industry of Death, providing detailed documentation and dozens of videos on this and other destructive psychiatric practices to educate the people of Prague and warn them about potential harm to their children. Citizens Commission on Human Rights (CCHR) is a nonprofit charitable mental health watchdog cofounded in 1969 by the Church of Scientology and professor of psychiatry Dr. Thomas Szasz. It is dedicated to eradicating psychiatric abuse and ensuring patient protection. With headquarters in Los Angeles, California, CCHR International guides a global human rights advocacy network of some 180 chapters across 34 nations. CCHR Commissioners include physicians, psychiatrists, psychologists, lawyers, legislators, government officials, educators and civil rights representatives.